The Non-Contacting LVDT Position Sensors from NewTek are designed for high temperature downhole drilling, wellbore case profiling and wire and cable line tension measurement applications. The hermetically-sealed units can withstand sulfides, acids, drilling mud and corrosive chemicals. They are constructed with special materials to provide reliable operations in temperatures up to 400°F. The sensors are offered in configurations with a 3/8 in. outer diameter. Pennsauken, NJ, September 6, 2018… NewTek Sensor Solutions offers standard and custom LVDT Position Sensors that operate with excellent reliability and infinite resolution in the high-pressure and high-temperature environments of downhole drilling applications. Robust, rugged, and friction-free, NewTek LVDTs ensure accurate position feedback for the oil and gas industry to avoid costly downtime associated with failing sensors. 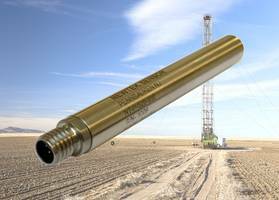 Linear position sensors from NewTek are ideal for use in a variety of downhole applications including cutter orientation to ensure accurate drilling direction, wellbore case profiling for active predictive maintenance as well as wire and cable line tension measurement. Addressing the extreme temperatures and pressures present in drilling environments, NewTek LVDTs are constructed with special materials that ensure reliable operation in temperatures up to 400°F (204°C) and pressures to 20,000 psi (1380 bar). Hermetically-sealed LVDTs withstand exposure to a variety of fluids including sulfides, acids, drilling mud, and other corrosive chemicals. In the most demanding environments, linear position sensors constructed of exotic electrical materials, ceramics and special core materials meet temperature requirements up to 1000°F (538°C). NewTek also offers subminiature LVDT configurations with a 3/8” outer diameter and low-mass core to fit in areas and devices with limited space and vented units that withstand a combination of high pressures, temperatures, shock, and vibration. For more information about NewTek LVDTs, refer to the website at http://www.newteksensors.com/oil-gas/ or contact Mike Marciante at 856-406-6877 to discuss your application requirements. NewTek Sensor Solutions designs and manufactures standard, custom, and harsh environment LVDT-based linear position sensors for a variety of industries including power generation, factory automation, oil and gas exploration, aerospace/mil, chemical processing, subsea oil drilling and automotive testing. Incorporated in 2016, NewTek Sensors offers more than 200 years of cumulative LVDT design and manufacturing experience by its key staff in serving an OEM and end-user customer base. The company differentiates itself in the market by delivering high-quality, made-in-the-USA LVDTs at cost-effective price points in short timelines. www.newteksensors.com.